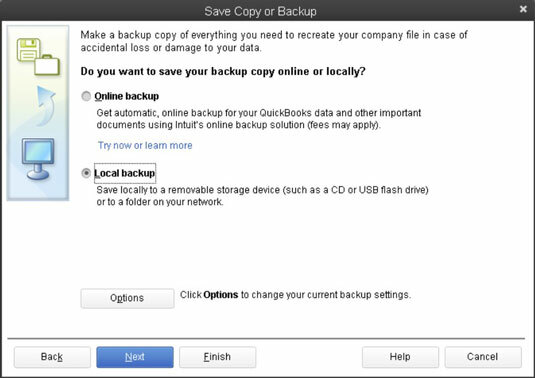 The QuickBooks 2013 Save Copy or Backup dialog box shown below, includes an Online option button. If you want to find out more about backing up the QuickBooks company data file online — which means using Intuit’s computer network rather than your computer or some removable disk to store the backup — you can select the Online radio button. Less effort: Online backup can make the task of backing up less work and more regular as long as you have a reliable Internet connection. You don’t need to remember to back up and then remember to take the backup disk home.